Book Etihad Airways flights & plane tickets on NusaTrip.com. Search any flight routes, compare prices with other airlines : Simple & Fast, 24/7 instant booking. Etihad Airways is the flag carrier airline of the United Arab Emirates. The airline has received a range of awards that reflect its position as one of the world’s leading premium airline brands, including ‘World’s Leading Airline’ at the World Travel Awards for five consecutive years in 2009, 2010, 2011, 2012 and 2013. Etihad’s fleet of 88 aircraft operates more than 1400 flights per week, serving an international network of 84 passenger and cargo destinations in the Middle East, Africa, Europe, Asia, Australia and North America. Diamond First Class: Etihad Diamond First Class seat comes with a private cabin, personal mini bar, 6ft 8” leather fully-flat bed seat, with pure silk and cotton duvet, fitted sheet, cosy blankets, full-sized pillows, and slippers all available to use. 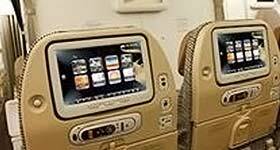 Guests may recharge their laptop or iPod or connect personal devices to the E-BOX, Etihad Airways entertainment system. In-seat power sockets compatible with most major plug types available on each seats. Foods can be requested all day long with 'Anytime Kitchen' service. On-board chef and Food & Beverage Managers are ready to assist during the flight. Pearl Business Class: Etihad Pearl Business Class has won World’s Best Business Class as voted by Skytrax 2009. Comes with a privacy shell, business class seats that can be turned into 6 ft 1 inch full flat bed and direct aisle access from every seat. In-seat power sockets compatible with most major plug types available on each seats. Foods can be requested all day long with 'Anytime Kitchen' service. Food & Beverage Managers are ready to assist during the flight. 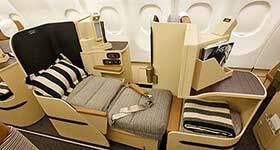 Coral Economy Class: Etihad Coral Economy Class is equipped with one of the world’s most spacious and ergonomically designed economy seats. The ‘cradle recline’ feature ensures that your spine rests in a more natural position, with a seat pitch of between 32 and 34 inches. 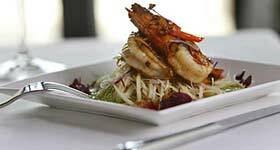 Foods are provided on board with three choices of meal, special food must be requested at the time of booking or at least 24 hours prior to departure. By 14 September 2015, Etihad Airways changed its checked baggage allowances and its excess baggage rates. Coral Economy Class : Each passenger allowed to bring 2 bags with a total weight not exceeding 23kg each. Economy Breaking deals and Economy Saver Fare Choices: Passenger can bring 1 bag with total weight not exceeding 23 kg. To/ from US or Canada: Passenger can bring up to 2 bags, with total weight not exceeding 23 kg each. Items must not exceed the dimensions 207 cm (45cm x 72cm x 90cm). For passenger to / from Canada and the US: the limit is 158cm (50x70x38) and even if you choose to exceed your luggage allowance (at additional cost) each item must not exceed 32kg. Pearl Business Class : Each passenger allowed to bring 2 bags with a total weight not exceeding 32kg each. To/ from US or Canada: Passenger can bring up to 2 bags, with total weight not exceeding 32 kg each. Diamond First Class : Each passenger allowed to bring 2 bags with a total weight not exceeding 32kg each. Infants : Infant's allowance for checked in baggage is one bag up to 10kg and one (1) fully collapsible stroller / carry-cot, as a carry-on item if cabin space is available or else as checked baggage in the hold. Diamond First Class : A 23-inch cinematic widescreen and E-BOX Inflight Entertainment to show you a choice of over 675 hours of on-demand entertainment with noise-cancelling headphones. Every seat has all that’s required to help guest to work or play, including power sockets compatible with all major plug types, as well as iPod, USB, Ethernet and audio jack sockets. 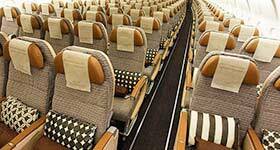 In-seat and mobile telephony and Wi-Fi services are available. Pearl Business Class : A 15.4-inch screen and E-BOX Inflight Entertainment to show you a choice of over 675 hours of on-demand entertainment with noise-cancelling headphones. Power sockets compatible with all major plug types, as well as iPod, USB, Ethernet and audio jack sockets are available. Coral Economy Class : Each seats are equipped with 10.4-inch individual touchscreens, with more than 675 hours of movies, TV, music and interactive games available on demand on E-BOX, in-seat power sockets are available. Visa on Arrival Service : Citizens of the countries listed by Etihad Airways are allowed to enter the UAE without a visa prior to arrival as long as they are carrying a valid passport that will not expire within six months of their arrival date. Immigration officials may grant a visit visa, which is valid for 30 days, on arrival at the port of entry. 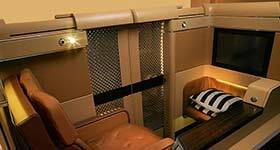 Etihad special seats; The extra legroom seats are assigned only upon full payment of the extra legroom seat fees and ticket fare. You are only able to make amendments or cancellations on the booking you are making prior to confirming your reservation. The extra-legroom seats are non-transferrable and non-refundable. Some Tickets are sold at discounted fares, which may be partially or completely non-refundable. Refund is available. If a Ticket has been paid for by a person other than the Passenger named in the Ticket, and the Ticket indicates that there is a restriction on refund, Etihad Airways shall make a refund only to the person who paid for the Ticket, or to that person's order.